In this appeal the Eleventh Circuit court of appeals reversed a federal court’s order denying the defendant’s motion to vacate his sentence pursuant to 28 U.S.C. 2255. In Phillips v U.S., the defendant had been charged with numerous drug related offenses and with being a felon in possession of ammunition. A jury convicted him on one count of conspiracy to distribute less than five grams of crack cocaine, one count of crack cocaine distribution, one count of cocaine possession, and two counts of possession of ammunition after a prior felony conviction. Following the filing of the defendant’s 2255 and while it was pending, the government discovered that Agent Michael Ghent an officer with the West Palm Beach Police Department had lied at trial, during the investigation and that he had been under investigation by his own police department for alleged criminal activities. Other investigations showed he had engaged in a sexual relationship with his CI, used illegal substances and provided false information in various government forms and submitted a false affidavit in a state criminal prosecution. The parties (United States Attorney) joined in the defendant jointly agreed that the conviction should be vacated because he provided false testimony at the trial. 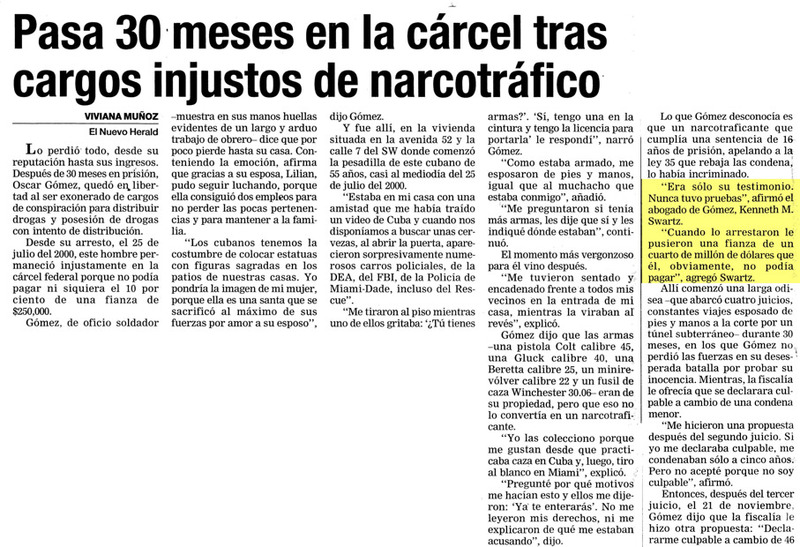 The district court that one of the counts should be vacated because Ghent provided the only testimony about the April 6, 2001 drug transaction that supported the charge. As to the other counts the district court found ample co-conspirator testimony, apart from Ghent’s perjured testimony from which the jury could have concluded that the defendant was involved in a conspiracy to distribute the crack cocaine. Reversing the district court’s decision, the court of appeals found the conspiracy drug count should be vacated. It found that Ghent’s false testimony was material to the government’s case and the government conceded that it cannot show the perjured testimony did not have a substantial and injurious effect on the verdict. The court vacated the conspiracy count. The court found the defendant had raised Giglio issue and to prevail on this claim a defendant must establish that the prosecutor knowingly used perjured testimony and that the falsehood was material. False testimony is material if there is any reasonable likelihood that it could have affected the judgment of the jury. A defendant raising a Giglio challenge on collateral review will only be granted if the violation at trial resulted in actual prejudice to the defendant. The error must have a substantial and injurious effect or influence in determining the jury’s verdict. The government conceded that Ghent gave false testimony at trial and that it cannot meet its burden of demonstrating that Ghents’’ testimony was immaterial. It was the sole evidence the jury had to convict the defendant on this count. The government’s federal criminal prosecution case was weak. It conceded the government cannot demonstrate that Ghent’s testimony satisfied the Brecht harmless standard and acknowledged that there is a reasonable likelihood that jury would have acquitted Phillips on this count had Ghent not testified. As for the Franks issue regarding Ghent’s false statements in the affidavit, the court upheld the district court’s decision that the false statement could be properly excised without compromising the probable cause.